Spit: a narrow coastal land formation that is tied to the coast at one end...Spits, which may be completely formed of shingle or sand, are formed by the longshore movement of sediment. They are often completed curved, with a characteristic recurved head (hook). After our wonderful Easter dinner with family last night, followed by a joyous church service this morning, Tim and I packed up some dinner leftovers and launched the boat for the first time this year. Our destination wasn't far - Sidney Island, clearly visible from our own, much larger island, just a couple of kilometres away. Scenic Mount Baker showed her pretty white head across the water. 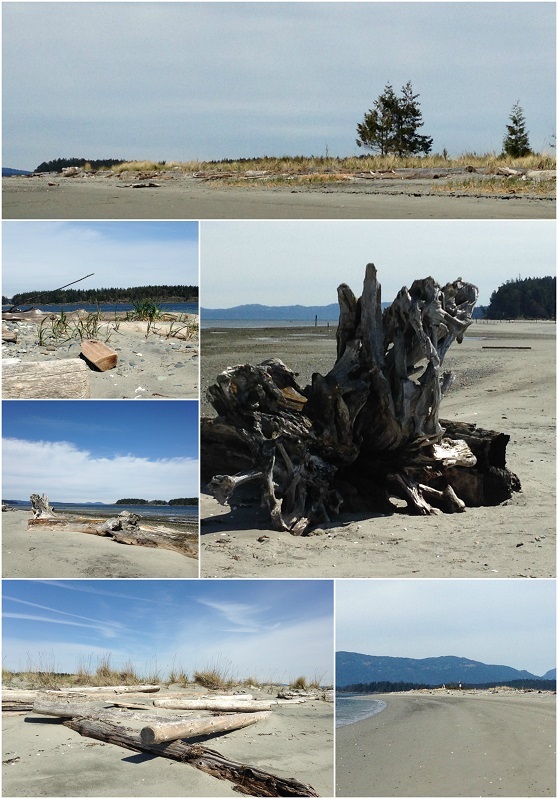 I've wanted to walk the length of the sand spit on the north side of the island for a long time. The spit is mostly covered by water during high tide. Today, though, a very low tide happened mid-afternoon, enabling us to walk the full length (2 kilometres) of the spit and back with ease. We did not dawdle on our walk, for although the sun shone most of the time, the wind whistled about our ears and had me pulling up my hoodie for warmth. The east side of the spit is sandy beach that rises up to a narrow top and then falls away on the other side to mud, rocks and intertidal pools where birds like to congregate. Today we saw Great Blue Herons, Gulls, Eagles, and migratory Brant Geese en route to their northern nesting grounds in the Arctic. At the south end of the spit, one-third of Sidney Island comprises a national park, and the other two-thirds is privately owned. In the early 20th century, a group of Victoria business men purchased the island to use as a hunting preserve. They introduced guinea fowl and peacocks, as well as fallow deer that are now considered invasive. A view from the trail lookout, slightly above the beach, shows the meandering shoreline of the spit. After returning to our boat (via the dinghy), we tried relaxing and reading for awhile, but the rocking waves soon had us firing up the engine and heading back to shore. All in all, it was a successful first run for the season, and we hope to do some longer trips in the near future. What a beautiful way to spend the afternoon! By the way, we did sing "Up from the Grave He Arose," this morning! I thought of you! A perfect Easter weekend outing. Lovely Easter afternoon...Sorry that the waves were unccoperative. I'm sure it would have been pleasant to read or nap away the afternoon. I like the way your family plans...Easter dinner on Easter eve sounds very pleasant. Looks like a lovely spot to visit, and you got to walk the full length. We love to visit Wiffen Spit in Sooke. The perfect place to spend some downtime together after a busy time with your family, the sort of place the SP and I would enjoy. What a great kickoff to the boating season. I don't sail so I'll have to live vicariously through you! Lorrie, I`m glad you first run was good. I love walking on the beach but I don`t it much that my sister has joined me on the prairies. She has lived in Nova Scotia and Florida which provided some beach walking time. Have a great day. Sylvia D.
Lorrie, the pictures of the shore look so peaceful. What a wonderful way to spend an Easter holiday! How lovely to get out on the water and walk along the spit. I think the rocking of the boat would have put me to sleep. Hope your Easter was extra special. A lovely day to launch! We were so pleased to get sunshine and warmer weather on Easter...glorious. Hope you are having a great week. Wow! So beautiful! What a nice date! Beautiful pictures, Lorrie. And a lovely first sail and outing.....I love all the blue sea and sky and wonderful scenery. It looks like a lovely little getaway and so peaceful and relaxing. Perfect for the two of you after a busy weekend. It looks beautiful there Lorrie. The white sand beach is nice. It must have felt wonderful to get out on the boat again. I hope you have a fun boating season ahead. Lovely! How nice to have a rain free Easter Sunday this year! What a wonderful getaway for you and your sweetie, Lorrie, after the Easter meal the day before, and the church service. You tow have more fun on such nice excursions on your boat...lovely memories for you both. What a wonderful way to spend a day. I am glad it was warm enough for you to go out on your boat. Have a nice week Lorrie. What a perfect way to spend the day. I hope you are enjoying a lovely spring and may you have a wonderful week. Gorgeous photos, Lorrie! Sidney Spit looks and sounds like the perfect getaway, offering beautiful views, wonderful terrain to trek and pretty places to sit and reflect. Despite the chill, I'm certain your trip proved to be invigorating. Just to say, quickly, that I'm still very much reading and enjoying your blog, even though I don't seem to be finding much time to comment these days. Those pictures of you and siblings in your Easter coats and matching hats brought back such memories! And as always I love your Nature and Garden photograph -- really missing the White Fawn Lilies which bloom magnificently back on the island we left, but not so much here in the city . . . .